RPGs and gaming...because the internet needs more opinions. My first serious Fate Core hack was an attempt at the creation of starship combat rules which could be used stand-alone and as part of roleplaying sessions. The version I reference here is the 3rd iteration of the rules. My group and I have done a few playtest sessions which resulted in some minor and major modifications to the rules. I feel that this 3rd iteration has come a long way and has streamlined much of the rules. For the impatient, the rules may be found here. There is an example battle map and a starship sheet you can print for your games. During playtesting, we attempted a number of approaches to weapons and damage. The way starship skills were allocated changed very early on as well. I documented many of the approaches in Fate to weapons, armour and damage here. An early modification was to change the starship skill pyramid into a double column. The first playtest was with a pyramid, and we played with Enormous (6) Hull ships on each side. The amount of skills (systems) gained was crazy. Ships had three or more beam weapons and multiple squads of Marines - 4 in one instance. Ship creation also took much longer than it should have for a one-off battle. It was all a bit much. I didn't want a small ship with a Medium (3) Hull to only have a couple of skill slots. The balancing was difficult because at larger hulls, you end up with way too many. Eventually, after running some numbers I arrived at a double column. This was a very good fit for all sizes of ships. I'm quite happy with this now. The first weapon system we tried was a variant of Weapon Min Stress vs. Armour Stress & Consequences where weapons did a minimum amount of damage based on the skill ranks. This turned out to be too hard to remember and figure out when a starship had multiple weapons of various ranks. I abandoned the armour stress early on before the first play test after reading comments on the G+ Fate Core group which indicated that would make combat last longer and bog it down. I only kept the minimum stress for the first playtest. The problem we found was with tracking the minimum stress since if you had more than one weapon, they all did different minimum damage based on the skill ranks. What really complicated things was things like Flack, Shields and Drones. They had to fit into the system with what they offered. Things got unbalanced and too complicated for what I wanted. The second weapon system was an attempt at using For Better Or Worse where the scale was determined by the skill ranks in the skill rather than hull size. For example an Average (+1) Structure was considered Small in scale and a Legendary (+8) Structure was Huge. The progression was 0-2: Small, 3-4: Medium, 5-6: Large and 7-8: Huge. Up to two shifts were considered for a max bonus of +2. This was in many ways even worse because now there was a whole mix of ranks of weapons and defence which confused things tremendously. Again the Flack, Shields and Drones proved to be hard to fit into this system without additional rules. At the end of the day, this was less favourable than the first attempt. The final weapon revision came about mid way through the last playtest. We got annoyed with how things were calculated and took a time out to discuss the pros and cons of the current and previous systems. We quickly agreed they were not ideal, nor intuitive. During discussion I threw out there the free invokes system which the Fate Freeport Companion had. Immediately everyone's ears perked up and they all nodded. We tried it, and it worked amazingly. The tracking was simple with a few boxes on the starship sheet. I decided that the number of free Boosts you get per battle scene is equal to the ranks in your skill. A maximum of two may be used at a time, like the limit of a single Advantage. The rest is detailed in the starship rules link above. The exercise of these standalone battles was a great introduction for my group to the basics of Fate. Since were were just having fun and trying to figure out an optimal system, everyone had a great time playing something everyone knew how - miniature battles. In the second playtest we used Aspects. I was surprised at the amazing Aspects the players came up with on their own after a brief intro to what they do and how they are used. The Aspects became on many different occasions and the players quickly grasped how to take advantage of them, and when. Give the rules a spin, let me know what you think and how you think the rules might be improved. Not everything in the 3rd revision was playtested either. As a designer, I found it most helpful to stand back and GM the battles rather than play them. The time I had to observe the players and where they stumbled or had issues was a huge benefit. 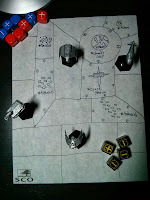 For those curious, the miniatures we used were from the Fading Suns Noble Armada starship board game. (c) Mark Kowaliszyn. Simple theme. Powered by Blogger.